To realize the productivity and collaboration benefits of SharePoint, Microsoft recommends SharePoint Online with Microsoft Office 365. If SharePoint Online is not the best option for you right now, you can deploy SharePoint Server 2016 on intranet servers, which can be in your on-premises datacenter or hosted in Microsoft Azure infrastructure services. Whether it's for development, testing, staging, production, or disaster recovery purposes, Azure is a perfect home for your SharePoint farms in the cloud. You can deploy a SharePoint Server 2016 farm rapidly and scale it up or down as needed. You can create the infrastructure for your SharePoint servers very quickly using multiple tools and methods. Set up development or test farms or scale out your production SharePoint deployments by adding more resources. Simplify deployment and configuration with ready-to-deploy images and reduce the time to deploy complex SharePoint farms from days to hours. You can host your SharePoint Server 2016 farm cost-effectively. Pay-as-you-go pricing for server and storage capacity and per-minute billing from Azure helps you save money. When performing application or performance testing, create additional servers as needed for scale and load testing over short periods of time and remove them when you're finished. Using and paying for only the resources that you need—and no more—helps you reduce costs. You can seamlessly move virtual machines between on-premises and Azure. Quickly and easily replicate your SharePoint Server 2016 dev-test environments or secondary production sites in Azure. Move them back on-premises when the need arises. You can run your Microsoft applications where they run best. Choosing Azure to host your SharePoint Server 2016 farms is a safe bet on the cloud that was built by the same company that built SharePoint and SQL Server. These applications have been battle-tested to perform well on Azure. Use your existing licenses with license mobility and the Azure Hybrid Use Benefit, and get first-class, first-party support across Azure, SharePoint, and SQL Server. Running your SharePoint Server 2016 farms on Azure ensures your solution is running on the same cloud framework that hosts Office 365 and Microsoft Dynamics 365. To create a single-server farm running in Azure for demonstration, evaluation, or application testing, see Single-server SharePoint Server 2016 farm in Azure. To simulate the user experience and administration of an intranet SharePoint Server 2016 farm running in Azure, see Intranet SharePoint Server 2016 in Azure dev/test environment. To design the elements of Azure infrastructure services to host a custom dev/test environment, a production farm, or a disaster recovery farm, see Designing a SharePoint Server 2016 farm in Azure. 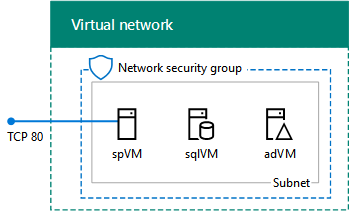 See Deploying SharePoint Server 2016 with SQL Server AlwaysOn Availability Groups in Azure for step-by-step instructions on how to build out this high-availability intranet production farm in Azure.